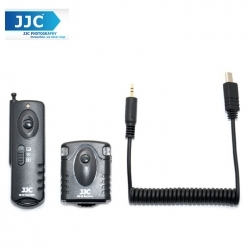 JJC JM-F2(II) Radio Frequency Wireless Shutter is designed for Sony camera adopts a multi interface. The system works at a 433MHZ frequency and has 16 available channels. In addition, this wireless remote system adopts a technology to allow the transmitter trigger the receiver without direct line of sight up to 30 meters. The JM-F2(II) receiver simply connected to the camera's remote socket by the supplied JJC receiver cable. JM-F2(II) transmitter can trigger the camera shutter at five modes: single shot, 5 seconds delay shot, 3 continuous shots, unlimited continuous shots and bulb shot. The receiver has a 1/4"-20 tripod mount socket on the bottom, so you can even mount the receiver onto a tripod. Most important, our JM-F2(II) transmitter is able to fire multiple receivers at the same time. The receiver itself with the connecting cable can be used as a Wired Remote Switch, then half press to focus, full press to take a photo. JJC JM-F2(II) replaces Sony MULTI Connector.